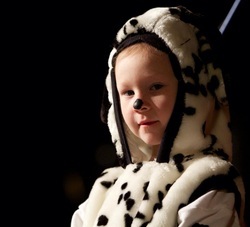 Our musical theatre classes culminate in a FULL performance, on STAGE with sets, lighting, microphones, make-up and costumes. We spend thousands of dollars on renting stages, teaching materials, props, sets and costumes so you will receive the BEST theatre experience possible! 2. Students gain experience on-stage and backstage. 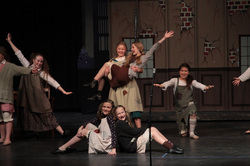 Not only will students perform, but they learn and grow in musical theatre skills in many areas. Older students have the opportunity to work hands-on backstage, with lighting, and set construction. Some graduated students have continued as Interns helping direct students, designing and painting sets, managing the stage and assisting the instructors. 3. Experienced vocal, drama and choreography instructors. Our teaching staff have professional experience teaching students of all ages and experience in Music, Drama, and Choreography. 4. High morals and standards. We are a FAMILY owned theatre. Our classes are taught with positive, encouraging teaching styles and our performances will always be an excellent choice for ALL ages to attend. 5. All students have a part, no matter their experience. By enrolling in our classes, you WILL be in the cast of your show and you WILL receive acting, singing, and dancing training no matter what your experience or skill level. Every enrolled student has a part in their show~major, minor and ensemble roles. Classes are offered after school, in the evenings and during the summer days and evenings. 7. Affordable for the family. We strive to inform you of any extra fees up front. NO HIDDEN COSTS! NO fund raising required. We offer Fall and Winter/Spring semester classes and Summer Theatre Camps, so there is always a convenient time to join! Our classes rehearse in our new, beautiful, permanent Rehearsals Studios, located in Rogers, Mn, convenient to all northwest suburbs. Many of our students come from distances for training and find carpool opportunities with other FPMT parents. 10. We care about each student's personal goals. We teach students who desire to act for enjoyment and personal enrichment, students who desire to improve their confidence in singing and acting in front of an audience, and students who are preparing for a professional career on stage. Students of FPMT have gone on to act at Children's Theatre, Stages Theatre, Lyric Arts, Chanhassen Dinner Theater, Guthrie Theatre, community theaters and in their local high school's and college's productions.